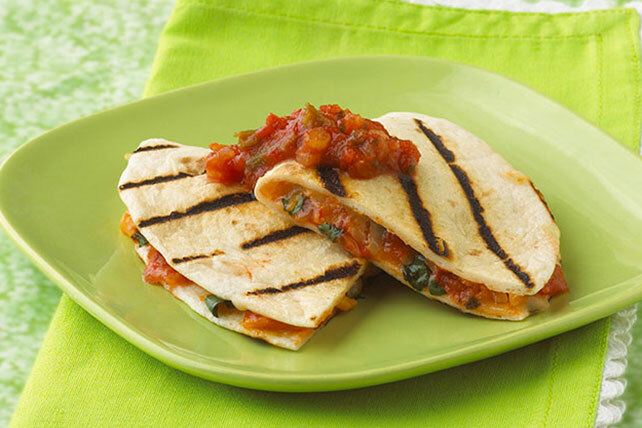 Cheese slices and red onions give these Grilled Chicken Quesadillas a nice flash of color—and the cilantro and BBQ sauce provide great flavor. Grill chicken 5 to 6 min. on each side or until done (165ºF), brushing with barbecue sauce for the last 5 min. Cut into thin strips. Substitute 2 sliced green onions for the cilantro. Wash and sanitize countertops, cutting boards, utensils and sinks after contact with raw meats and poultry. Use hot soapy water to wash the surfaces, then rinse thoroughly.